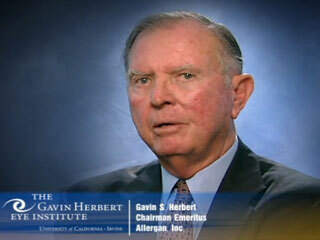 Gavin S. Herbert, chairman emeritus of Allergan, Inc., explains UC Irvine's unique role in spurring sight-saving research in Orange County. UC Irvine's Gavin Herbert Eye Institute is deeply grateful to the many members of the Orange County community who have so generously supported efforts to build a new home for one of the world's foremost centers for eye research, treatment and patient care. Gibson, Dunn and Crutcher, LLP. For more information about our Shine-the-Light capital campaign, please call 949.824.6211.